And another launch brings the total to five so far this year for Arianespace after today's successful launch of the European Space Agency’s (ESA) Aeolus satellite, the first space mission designed to acquire profiles of Earth’s winds on a global scale. The launch took place on Wednesday, August 22, 2018, after a delay yesterday due to weather conditions, at 6:20 p.m. (local time) from the Guiana Space Center (CSG), Europe’s Spaceport in French Guiana (South America). 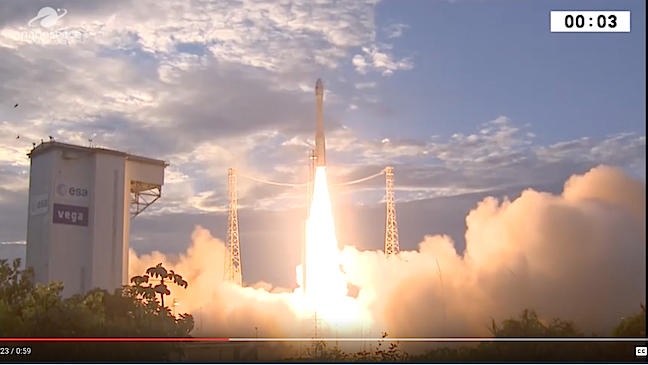 Today’s launch was the fifth of the year for Arianespace, the first with Vega and the 12th successful launch in a row of this light launcher that demonstrates the innovative mission and Arianespace’s commitment to sustainable development, and to guaranteeing independent access to space for Europe. The Arianespace commercial launcher family was expanded in 2012 with the addition of Vega, a new-generation vehicle for flights with small- to medium-sized satellite payloads. This European four-stage launcher is tailored to carry the growing number of small scientific spacecraft and other lighter-weight payloads under development or planned worldwide. Aeolus is the first space mission designed to measure wind profiles across the entire planet. It will deliver data and 3D dynamic maps that will help improve weather forecasting and climate research. The first wind observation satellite using laser technology, Aeolus carries a single instrument, a Doppler wind lidar called Aladin (Atmospheric LAser Doppler INstrument). This instrument will probe the atmosphere with pioneering ultraviolet laser pulses, which will enhance our understanding of tropical dynamics and processes relevant to climate variability. Fully committed to making life better on Earth, Arianespace has already launched 65 Earth observation satellites in the framework of 46 missions. These satellites primarily are designed for meteorology, mapping and environmental monitoring (land, oceans and atmosphere). Arianespace leverages the versatility of its complete family of launch vehicles, Ariane, Soyuz and Vega, to carry out these missions for European institutions and governments, as well as in export markets. Three more Arianespace missions for Earth observation and environmental monitoring are scheduled in 2018, using all three launchers in the family. Along with the successful launch of the four latest Galileo satellites by Ariane 5 on July 25, today’s launch reflects the strong collaboration between ESA and Arianespace. In fact, this mission was the 50th performed for the European Space Agency by Arianespace, as it continues to guarantee independent and reliable access to space for Europe, and enable people from around the world to benefit from Europe’s ongoing investment in space technology. Arianespace’s next mission for ESA will be the launch of BepiColombo, a major scientific mission to explore the planet Mercury. BepiColombo is expected to lift off on an Ariane 5 in October this year. Today’s launch of Aeolus marks the 12th success in a row for the Vega light launcher since it was introduced at the Guiana Space Center in 2012. Based on this flawless performance, Vega has established its position as the most reliable and versatile launcher in its class. Avio, based at Colleferro in Italy, is the prime contractor for Vega, which was developed within the scope of an ESA program. Arianespace’s backlog includes nine missions for the Vega and Vega C launcher versions: one-third for European institutions and two-thirds for export customers. These nine missions comprise eight for Earth observation, as well as a grouped mission using the SSMS (Small Spacecraft Mission Service) system, which can carry up to 81 small satellites — demonstrating the launcher’s versatility and ability to respond to the dynamic small satellite market. The development of the new-generation Vega C is continuing, with a first flight planned in 2019. Compared with the current version, Vega C will offer higher performance in terms of payload capacity (weight and volume) and greater flexibility to handle a wider range of missions (from nanosatellites to large optical and radar observation satellites), further increasing the competitiveness of Arianespace’s launch solutions. Shortly after the announcement of the satellite’s orbital injection, Stéphane Israël, Chief Executive Officer of Arianespace, said: “With this fifth mission of the year, and the first launched by Vega, Arianespace also chalks up its 50th mission for the European Space Agency and expresses its primary vocation of ensuring autonomous and reliable access to space for Europe. “Arianespace is all the more proud of this success because Aeolus will support sustainable development and further our understanding of climate phenomena. More than ever, space will play a critical role in the mobilization needed to safeguard our planet.